My dad was a carpenter. A cabinet maker to be more precise. Trained in a small shop on an island in Croatia in the late 1920’s, I had the good fortune to sit with him in the same room where he learned his trade and watch him shake the dust off 70-year old memories. The workshop is now a residence, and his stories made all the more special since we were with the grandson and great grandchildren of the man who taught my dad his craft back in a time when even the tools they used were homemade. I was always proud of the fact that dad was a carpenter. Many things about dad and his immigrant story instilled pride, but for some reason that stamp – “carpenter” – stood out for me. I think it was the years of growing up watching him work in his shop with such care, reading glasses perched on the edge of his nose. The precision with which he fit together each piece. His knowledge of different woods and grains and when each should be used. And above all his pride in both the functionality and form of the creation. Fast forward to a different scene, one of technology intersecting process. I think of my experiences with system design and implementation . . . small company rollouts, leadership of a Fortune 500 program, and more recently a foray into Healthcare IT . . . and the lingering lessons of a carpenter come back to me. Measure twice and cut once. We’ve all done it. We’re building or repairing something. We need a specific length or size. We measure, oh so carefully. We cut, oh so carefully. And it doesn’t fit. We scratch our heads and wonder how it happened. With technology solutions, always measure twice. Ask, engage, articulate, reconfirm, revalidate, challenge. This applies not only to requirements and initial blueprinting, but to the very definition of the problem we’re trying to solve. The right tools can make all the difference. Back in my teen days, a friend used to tout that all he needed to fix anything was duct tape, vise grips and a hammer. It was somewhat true when it came to getting us out of a sticky situation, but he certainly wasn’t going to have any lasting impact with just those tools. Always make sure you have the right tools when it comes to designing and implementing technology solutions. This refers to leadership support, financial resources, enabling technologies, and above all talent. And never tilt cheap. Your tools will impact the success of everything you do, so invest in quality. Fit matters. I’m always in awe of cabinetry that relies very little on nails or screws but instead connects with dovetails and glue. This requires attention to curvature and detail. While a nail and hammer can likely gloss over shoddy fit, the quality of a well-matched dovetail is unmistakable. And so it is with technology and process. It takes effort and fine-tuning to achieve a seamless fit, but usability and successful adoption of the solution depend on it. Elegance is beautiful, but so is simplicity. Occasionally my wife and I will stroll through antique shops and come across a piece that’s very simple yet very appealing. Elegance can reflect quality in the way it solves design challenges, but quality also comes in simple forms. The beauty of the latter is in their devotion to core purpose. The same holds true for technology solutions and system design. Sophisticated solutions are sometimes necessary to transcend underlying complexity. But in situations where simple solutions meet the need, don’t over-engineer. Passion and pride transfers into the result. Among the trades, carpentry has distinction of being very visible. The result is often on display like a piece of art, and pride and passion for the craft are reflected in “the finish.” Customer satisfaction depends on form as well as functionality. System design is no different. The ubiquity of technology in our lives has shifted the focus from “user interface” to “user experience,” reflecting a deeper relationship between man and machine. The veneer of experiential design can make or break an otherwise superb technological accomplishment. And so as you solve for challenges at the intersection of system and process, of technology and humanity, always remember to view those challenges through the eyes of a craftsman. What are your thoughts? How have you dealt with these challenges? I’d love to hear your perspective. 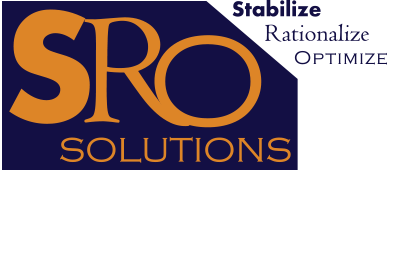 Email me at John@sro-solutions.com.